Apple is calling the iPhone 5S its most forward-looking design yet, and it's not kidding - the A7 processor at the heart of the new device is the world's first 64-bit smartphone CPU. Apple has evolved mobile architecture in a new direction, beating ARM's own 64-bit designs to the market in the process. On top of this potentially revolutionary advancement, it is promising the now customary 2x boost to both CPU and GPU power. The move to 64-bit processing undoubtedly boosts performance, especially with the news that iOS 7 itself is compiled around the new architecture in its 5S form. However, in itself, it can in no way account for such a marked speed increase over the existing A6 tech. Indeed, the implementation of 64-bit processing at this stage seems rather odd as we can safely assume that the new phone features well under 4GB of RAM - the threshold at which 64-bit addressing actually starts to make sense. To account for the boost in power, we need to look towards another key stat revealed in yesterday's presentation - the fact that the new A7 features over a billion transistors, double that of its predecessor. This may lend some weight to the notion that the A7 features a quad-core CPU configuration - though the lack of any mention of such an obvious marketing point in the presentation perhaps suggests not. The only other conclusion is that Apple's program of internally customizing the ARM Cortex architecture - a process that began with the "Swift" revision in the iPhone 5's A6 - is more wide-ranging than previously imagined, going beyond the additional 64-bit support. Since Apple itself has given away fewer clues than usual about the make-up of the new processor, its secrets are unlikely to be revealed until the phone is released and its new chip undergoes polysilicon die photography from industry analysts like Chipworks. That being the case, how Apple has achieved its 2x performance boost to graphics also remains a point of speculation. A PowerVR SGX543 in tri-core configuration, running at 266MHz, beats at the heart of the older A6. With such a generous transistor budget in the new chip, practically there is nothing to stop Apple simply doubling the core count. The identity of the GPU architecture remains unknown at this time, though Apple's pronounced support for the OpenGL ES 3.0 standard might hint at an entry-level PowerVR 6-series "Rogue" processor - the next-gen graphics tech from Imagination Technologies. Until now, Apple has utilized IMG's established 5-series tech and we're not aware of any OpenGL ES support there beyond the 2.0 standard. However, the SGX545 part can run full OpenGL 3.0 - so it should be theoretically possible to run the ES sub-set too. Despite the performance bump, recent Android phones like the Samsung Galaxy S4 should still command an advantage in terms of raw power, but the difference is that Apple has made no attempt to jump onto the ultra-resolution display bandwagon: the 4-inch screen remains at 1136x640 - around 35 per cent of the S4's 5-inch 1080p pixel count. Fewer pixels to address means that GPU resources should go a whole lot further, meaning more advanced effects work and/or higher frame-rates. Previous claims from Apple that the original iPhone 5 allowed for console-quality graphics held little water (assuming they were referring to the Xbox 360 and PS3), and even with a 2x boost to performance, we're still some way short of reaching that ideal, but the small, pixel-rich display will help mitigate the difference - just as it does on PlayStation Vita. 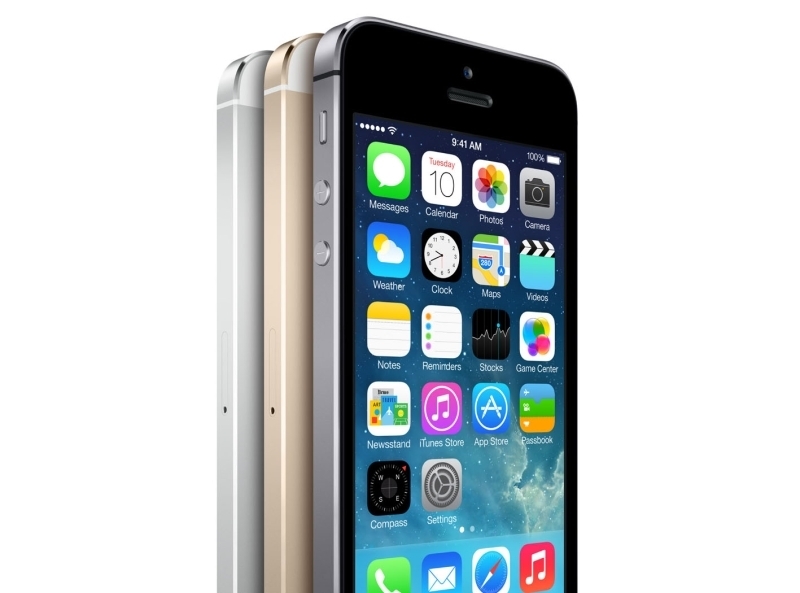 So is the iPhone 5S packing a next-gen mobile GPU? Well, Rogue is a true generational leap over the 5-series, to the point where we'd hope for more than "just" a 2x boost over the iPhone 5's graphics power and something more along the lines of the huge leap in performance we saw between the A4 and A5 processors. The evidence seems to suggest that Apple is holding onto full-blooded next-gen GPU parts for now and addressing a more fundamental issue: functionality. In our review of the iPhone 5, we liked the larger screen and the revised form factor, but while the boost to performance was welcome, it simply wasn't enough to make us consign our existing iPhone 4S to eBay. Indeed, to this day, the 4S is a highly capable performer - a little slow with multiple apps in memory, but still a great piece of kit and a testament to the stunning design of the A5 chip. Just how good A5 was - and is - has both helped and hindered Apple. The iPad 2 - introduced in March 2011 - saw the debut of the technology, but Apple continued to release products based on this design right up until November 2012. It's been an excellent performer for the company, but on the flipside, it was so good at handling games, browsing and other mobile tasks that even the 2x boost to performance seen in the iPhone 5 didn't translate into a massive difference in handling everyday tasks. We see it in the tablet space too, where an A5-powered iPad mini performs most mobile tasks just as well as the far more powerful iPad 4. There's a sense that the penny has dropped at Apple - that more power alone isn't enough to sell a new phone. Instead, the company is exploring how our smartphones are used - hence the arrival of the M7 processor, which offloads analysis of the phone's motion sensors from the CPU to bespoke hardware. Clearly there's fertile ground here for more advanced health, fitness and navigation apps with Apple supplying new "CoreMotion" APIs to developers. Secondly, a lot more effort has been put into the camera set-up. 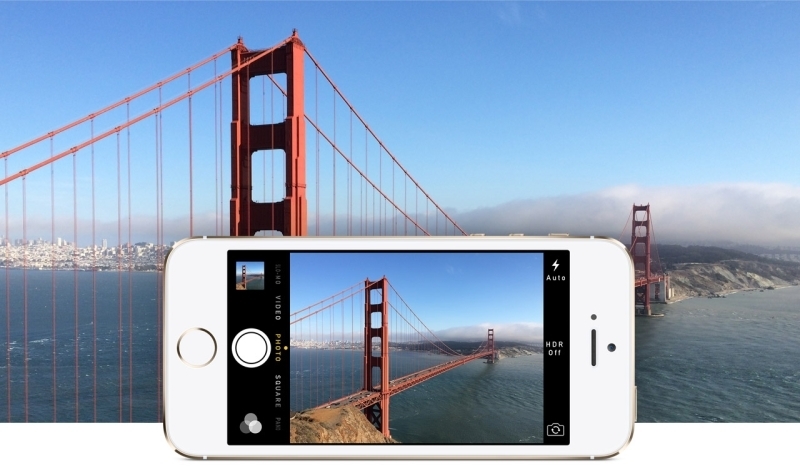 While other companies seem intent on putting smartphone tech into a compact camera chassis, Apple's approach is more about optimizing the existing form-factor for much improved shots. An 8-megapixel sensor remains, but the firm claims that larger CMOS pixels will result in better shots. Similarly, an adaptive, dynamic dual-tone flash more effectively captures skin-tones, there's a wider 2.2 aperture, while a burst mode allows users to choose the best shots in fast-action scenes. Perhaps best of all is the inclusion of 720p120 video (1080p30 remains too) - with the increased temporal resolution allowing for slow-motion photography, or simply for more life-like, smoother capture of sports and other fast-motion activities. The final flourish in Apple's drive for increased functionality is the new Touch ID sensor, built into the home button - designed for more user-friendly, increased security. The tech derives from AuthenTec, a firm Apple bought up last year, and uses a 500ppi capacitive sensor to scan your fingerprint at any angle. Apple claims that the sensor scans down to the sub-epidermal layers of your fingers to ensure accuracy, and can be used to replace the four digit passcode typically used to lock the iPhone, as well as being used for authentication when buying from the App Store. Factoring in how expensive the iPhone is, not to mention how lacking the current PIN system is, it's clearly a useful innovation. Videos of Touch ID in motion suggest a little lag when scanning in your fingerprint, but it should still be much faster than entering a four-digit PIN. Overall, the approach from Apple is probably the right one at this time. The temptation might have been to go large - as Samsung, Sony and HTC have done - and to ramp up the size of the screen along with the pixel density. Instead, the iPhone remains small, light, pocketable and easily used, with a range of new functions that should genuinely make a difference in our daily interactions with our phone. Clearly the success of those Android devices suggests demand in the market for a more media-centric product, but it's good to see that the choice for a top-tier smaller phone is still there, and that innovation can go beyond the display. 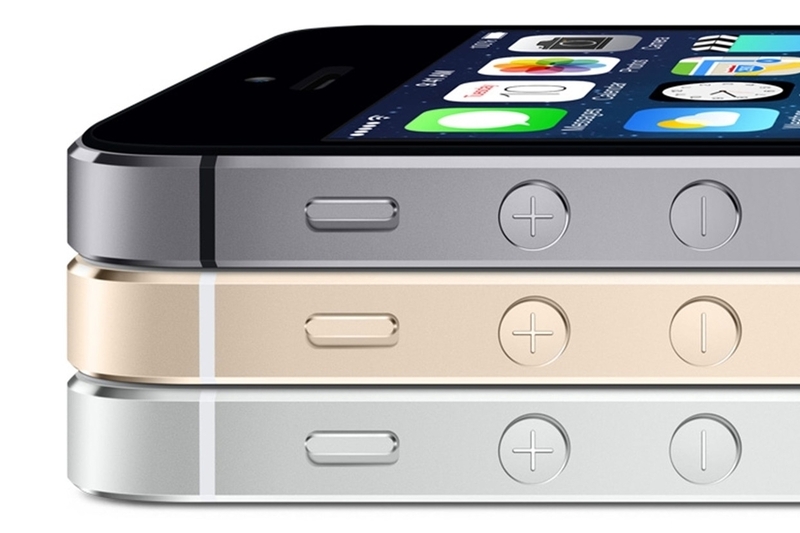 Where we remain uncertain is with the 5S's potential as a games machine. Apple has tangibly delivered on previous performance promises, so we're not too concerned about the new phone's spec - more the ubiquity of the older A5 processor, and the need for devs to primarily target two-year-old technology in order to get a decent return. Will developers actively target the capabilities of the A7 as a lead platform? And if not, how will mobile games scale upwards to make use of the abundant power available? Only time - and Infinity Blade 3, perhaps - will tell.